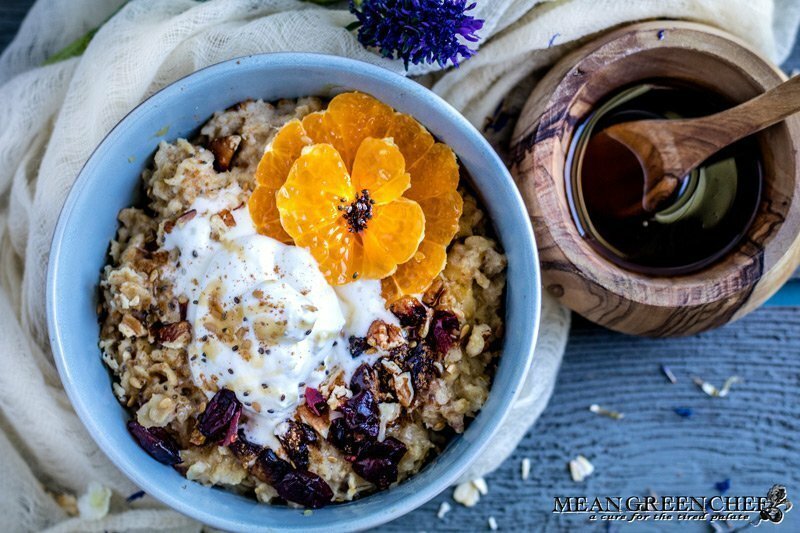 Our Spiced Mandarin Pecan Oatmeal is a totally new way to start the day! A great bowl of oatmeal can be the perfect eye-opener with tender plump grains that hold their bite and shape. It’s the ugly fruit that you seriously need to taste! No this is not durian fruit with its bad smell. In fact this the sweetest seedless mandarin orange you’ll ever have in your life. Sumo Citrus are seedless mandarins that are so delicious they’re often given as gifts in Japan, the country where they were grown. Now available in the US and Canada, Sumo is in season January-April. What kind of toppings can I use on oatmeal? Anything you like, I suggest trying it our way first and then get creative and toss in what you love! What type of oats do you use for oatmeal? Old-fashioned Oats: Are our main oat choice for oatmeal, their perfect chewy consistency is the base of most recipes. Sometimes called rolled oats, they have a flat oval shape which is achieved when the kernels are steamed and then rolled to flatten them. Lightly beat the cream in a large chilled bowl with a balloon whisk, or in an electric beater, until it begins to thicken. Add the honey and vanilla and continue to beat until the cream is stiff and stands in firm peaks on the beater. In a large heavy-bottomed saucepan bring the water, milk, butter, and salt to a boil. Stir in the oats and chopped dates. Reduce heat to medium-low and cook oats uncovered for 5 minutes, stirring occasionally. Remove from the heat. Transfer the oatmeal to bowls; top with Mandarin segments, whipped cream, pan roasted pecans, and a drizzle of honey. Serve immediately. Looking for other great breakfast ideas? Then be sure to check out some of our other recipes! This looks wonderful! I’d just leave off the whipped cream. Trying this soon.